In the 1980s I had a collection of envelopes from all over the world. In April 2017 I started again with a new collection. My aim: an envelope from every stamp issuing authority in the world, including local posts. Also envelopes with permanent pictorial postmarks and special means of sending mail. This collection and this blog will grow during the coming months and years. Comments and suggestions for links or (local) postal administrations are welcome. 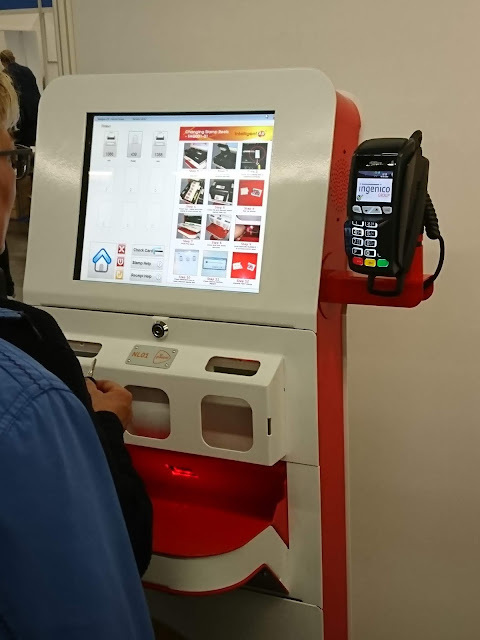 The new Netherlands ATM stamps can be found in a few permanent locations (since May 2018 there is only one location left). 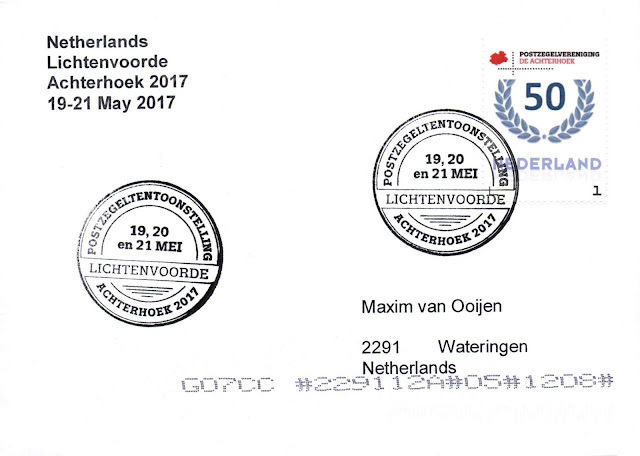 One of the ATM machines is used by PostNL for stamp shows and other special occasions. 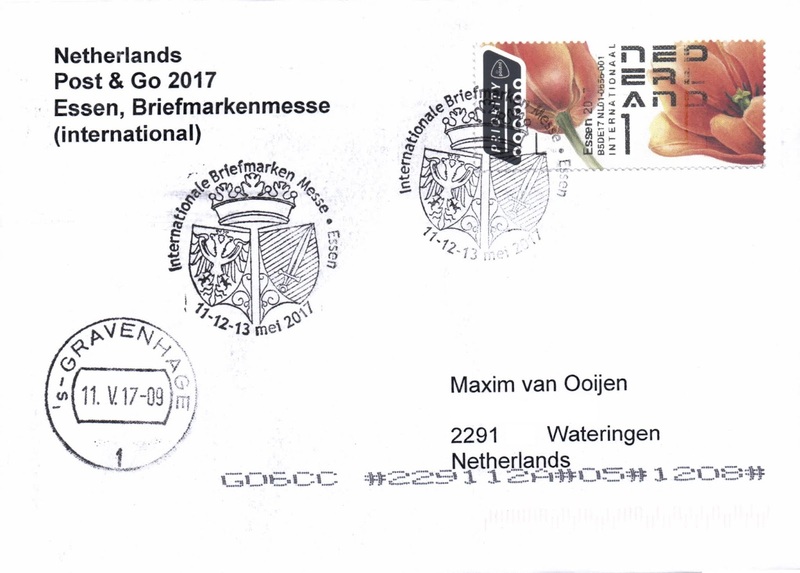 After the introduction at the stamp show in Hilversum in January 2017 the first occasion to get ATM stamps was the Briefmarkenmesse in Essen, Germany. 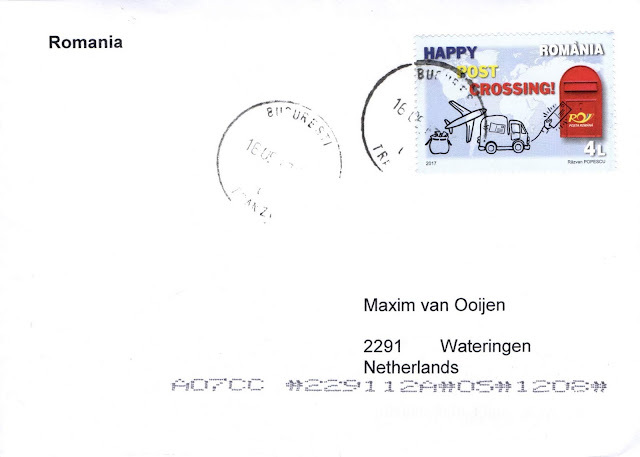 At this yearly event most European postal administrations are present with their latest stamps and other products. I arrived early in the morning of 11 May 2017 at the PostNL stand in the Messe building only to find a machine that didn't work and a long row of waiting collectors. It turned out that there was an unknown bug in the system. The supplier of the machine was working online from London to repair it. It took almost two hours for technician Bob to repair it. After that I had to wait for some time before it was my turn to get my stamps. I prepared two envelopes, one for each of the stamps. 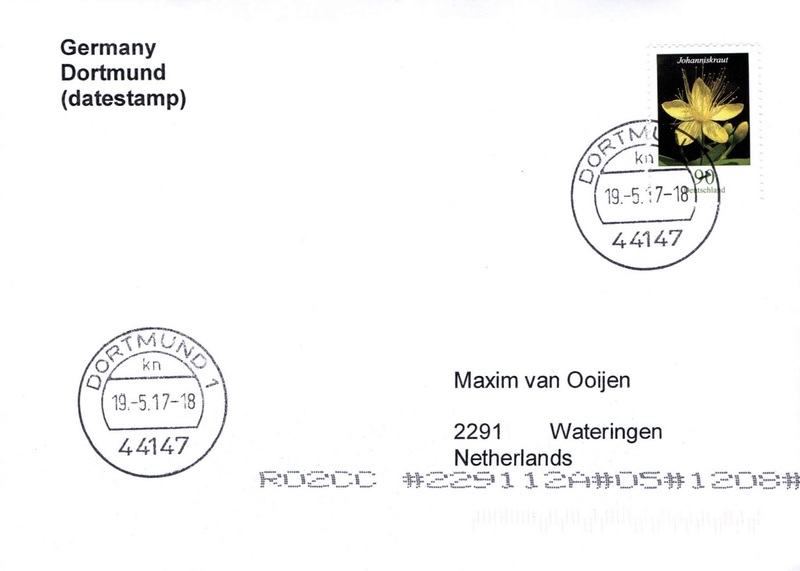 The ATM stamps have the normal design and the values of 1 (for national mail up to 20 grams) and INTERNATIONAAL 1 (for international mail up to 20 gr). 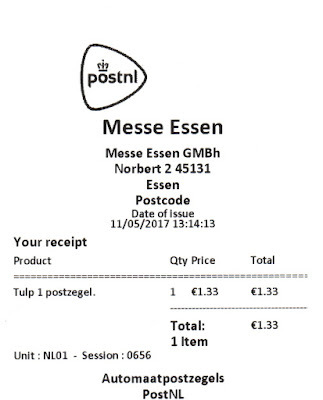 Printed above the machine and order number is the text Essen 2017. With each stamp I got a receipt from the ATM machine. Deutsche Post has established special philately windows in 26 major post offices throughout the country. Each uses a datestamp with the letters 'ps' in it to distinguish it from normal datestamps. The letters ps stand for Philatelie-Shop. The Philatelie-Shop in Braunschweig can be found in the Post Office Building in the city center. It was built in 1878-1881 under the direction of August Kind (1824-1904), the chief of the building department of the Reichspost under Heinrich von Stephan. 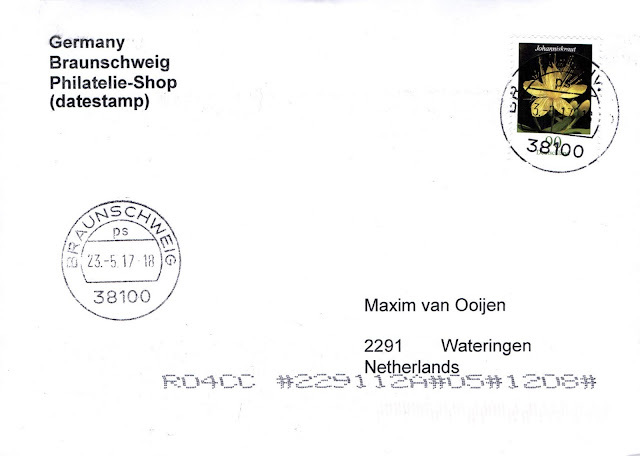 The address for postmark requests is: Friedrich-Wilhelm-Strasse 3, 38100 Braunschweig, Germany. 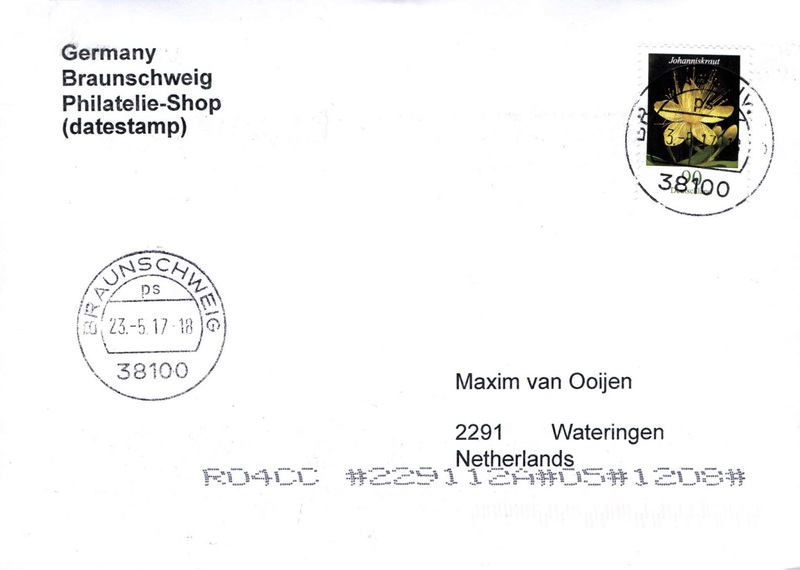 Opening hours: Mo-Fr 9.00-18.30 h., Sat 9.30-13.00 h.
For the envelope I used the new definitive 90 cent stamp from the flower series, issued on 11 May 2017 that I bought at the Philatelie-Shop in Essen on the first day of issue. 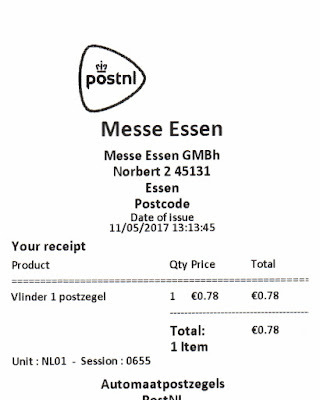 The priority label was added to the envelope by the German post. Romania is a country located at the crossroads of Central, Eastern, and Southeastern Europe. Modern Romania was formed in 1859 through a personal union of the Danubian Principalities of Moldavia and Wallachia. The new state, officially named Romania since 1866, gained independence from the Ottoman Empire in 1877. At the end of World War I, Transylvania, Banat, Bukovina, and Bessarabia united with the sovereign Kingdom of Romania. During World War II, Romania was an Axis power and, consequently, an ally of Nazi Germany against the Soviet Union, fighting side by side with the Wehrmacht until 1944, when it joined the Allies and faced occupation by the Red Army's forces. Throughout wartime Romania had lost several territories, of which only Northern Transylvania was regained after the war. Following the war, Romania became a socialist republic and member of the Warsaw Pact. After the 1989 Revolution, Romania began a transition towards democracy and a capitalist market economy. Following rapid economic growth in the early 2000s, Romania has an economy predominantly based on services, and is a producer and net exporter of machines and electric energy, featuring companies like Automobile Dacia and OMV Petrom. It has been a member of the United Nations since 1955, part of NATO since 2004, and part of the European Union since 2007. An overwhelming majority of the population identifies themselves as Eastern Orthodox Christians and are native speakers of Romanian, a Romance language. 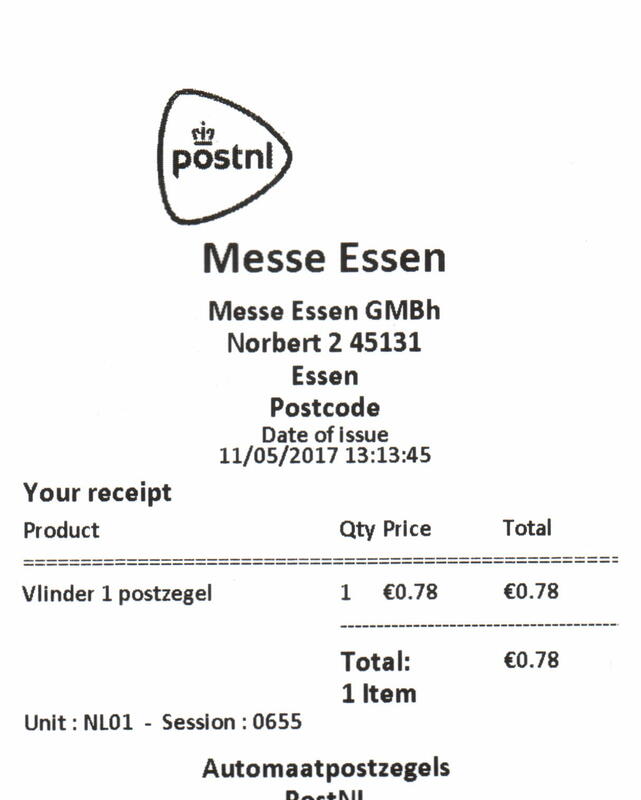 During the Briefmarken-Messe in Essen in May 2017 I left stamped envelopes at almost every foreign postal administration hoping they would send them back when they arrived home. The stamp I choses was a new one issued to honour Post Crossing. The stamp was postmarked with the datestamp of Bucuresti Tranzit, the Bucharest Regional Transit Center.. This and other stamps can be found on the website of Romfilatelia, the state company that issues the Romanian postage stamps: romfilatelia.ro. The name Ostarrîchi (Austria) has been in use since 996 when it was a margravate of the Duchy of Bavaria and from 1156 an independent duchy (later archduchy) of the Holy Roman Empire of the German Nation (Heiliges Römisches Reich 962–1806). Austria was dominated by the House of Habsburg and House of Habsburg-Lorraine (Haus Österreich) from 1273 to 1918. In 1808, when Emperor Francis II of Austria dissolved the Holy Roman Empire, Austria became the Austrian Empire, and was also part of the German Confederation until the Austro-Prussian War of 1866. In 1867, Austria formed a dual monarchy with Hungary: the Austro-Hungarian Empire (1867–1918). When this empire collapsed after the end of World War I in 1918, Austria was reduced to the main, mostly German-speaking areas of the empire (its current frontiers), and adopted the name The Republic of German-Austria. However the union and name were forbidden by the Allies at the Treaty of Versailles. This led to the creation of the First Austrian Republic (1918-1933). Following the First Republic, Austrofascism tried to keep Austria independent from the German Reich. Engelbert Dollfuss accepted that most Austrians were German and Austrian, but wanted Austria to remain independent from Germany. In 1938, Austrian-born Adolf Hitler annexed Austria to the German Reich with the Anschluss, which was supported by a large majority of the Austrian people. After the Second World War Austria again became an independent republic as the Second Republic in 1955 and joined the European Union in 1995. 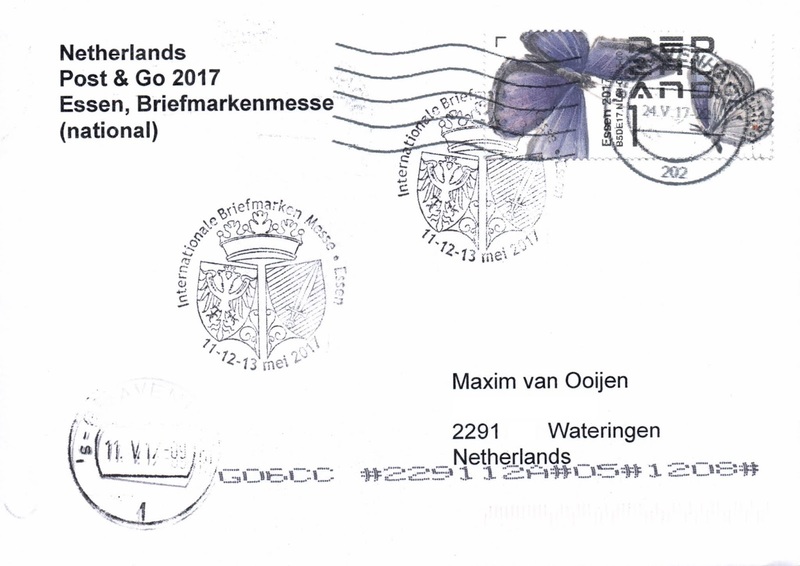 During the Briefmarken-Messe in Essen in May 2017 I left stamped envelopes at almost every foreign postal administration hoping they would send them back when they arrived home. The stamp was issued on 8 February 2017 commemorates Margherita Spiluttini, a photographer specializing in architecture. In 2015 she donated her archive with 120.000 negatives and slides to the Architekturzentrum Wien. The stamp was postmarked with the datestamp of Bergheim bei Salzburg, a town just north of Salzburg. Why the cover ended up there, I really don’t know. This and other stamps can be found on the website of Post AG, the Austrian Post: https://www.post.at/en/privat_briefmarken_und_philatelie.php. 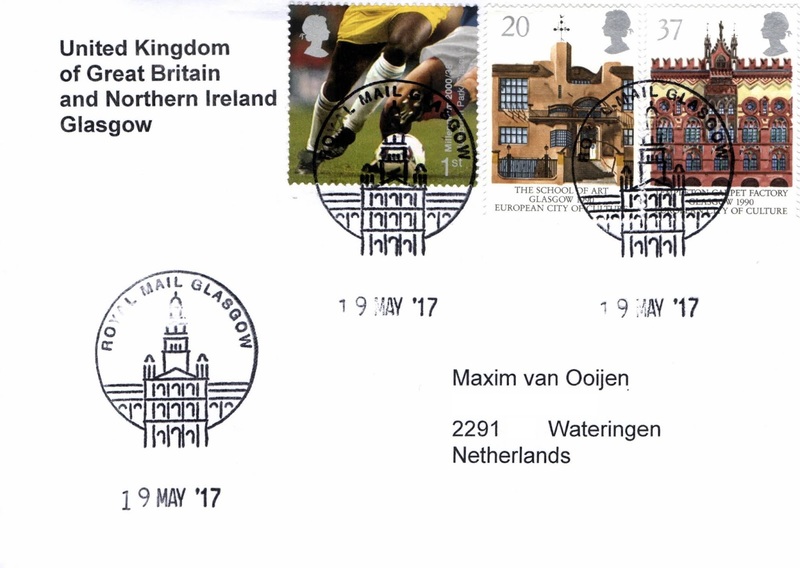 As a service to collectors Royal Mail has a number of pictorial postmarks in use for different cities. Each postmark shows a famous landmark and is available at one of the Special Handstamp Centres. The postmark for the Scottish city of Glasgow shows Glasgow City Chambers. The City Chambers or Municipal Buildings in Glasgow has functioned as the headquarters of Glasgow City Council since 1996, and of preceding forms of municipal government in the city since 1889, located on the eastern side of the city's George Square. An eminent example of Victorian civic architecture, the building was constructed between 1882 and 1888 to a competition winning design by Scottish architect William Young a native of Paisley. Inaugurated in August 1888 by Queen Victoria, the first council meeting was held within the chambers in October 1889. The building originally had an area of 5.016 square metres. In 1923, an extension to the east side of the building in John Street was opened and in 1984 Exchange House in George Street was completed, increasing the size of the City Chambers complex to some 14.000 square metres. For this pictorial postmark I managed to find three stamps from Glasgow, two issued for the European City of Culture in 1990 and one from the Millennium series featuring Hampden Park football stadium. The postmark (number 4656) can be obtained by writing to Northern Special Handstamp Center, Royal Mail Tallents House, 21 South Gyle Crescent, Edinburgh EH12 9PB, United Kingdom. 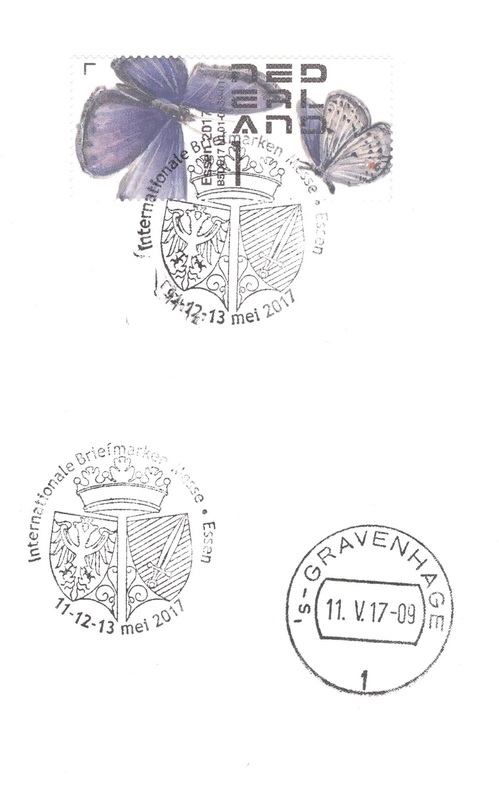 Images of all pictorial postmarks can be seen on the website of Norvik Philatelics: norphil.co.uk/postmarks/perm. 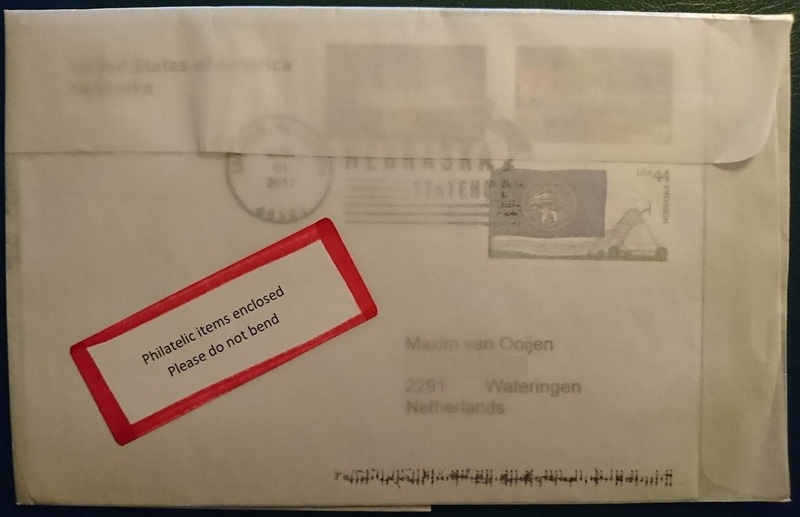 In my World envelope collection I do not just want to have envelopes from stamp-issuing countries and territories, but also from other regions. This includes the 50 states of the United States of America. This envelope comes from the state of Nebraska, lying in the Midwestern region of the United States as well as in the Great Plains. It was the 37th state, admitted in 1867. The stamps were affixed by me and come from the Flags of our nations and Greetings series and a stamp commemorating the 150th anniversary of statehood. I sent the envelope to the post office in the capital Lincoln to be postmarked. To my surprise the envelope did not arrive back with a normal Lincoln datestamp, but with a commemorative postmark for the 150th anniversary of Nebraska statehood which was dated two months before I sent my envelope to Lincoln. 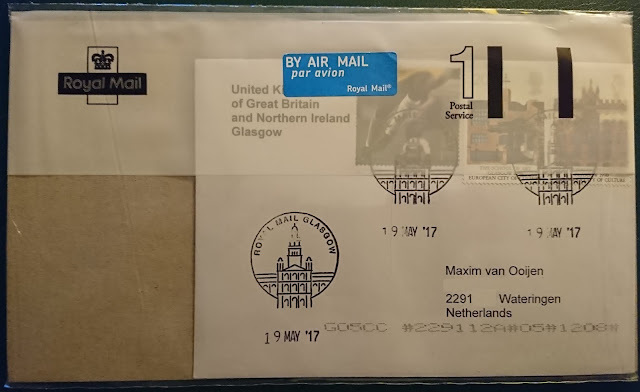 The post office returned the envelope inside a glassine envelope, thus protecting it from getting a machine cancellation. I was already collecting the datestamps of German Philatelie-Shops, when I came across a normal German datestamp at the stamp exhibition in Lichtenvoorde (Netherlands). Here Deutsche Post was represented with a mobile post office. Normally events in the Netherlands are attended by the Erlebnis Briefmarken‑team from Bochum, which lies between Essen and Dortmund. In a mobile post office there is always a datestamp present for those collectors that want cancelled stamps. For some reason the Bochum team always carries the same datestamp from Dortmund. What the letters kn in the datestamp meant, the man could not tell me. Fortunately I carry always spare envelopes with my name and address with me. I put the new definitive 90 cent stamp from the flower series on it and asked for a cancellation on the stamp and on the left hand side. 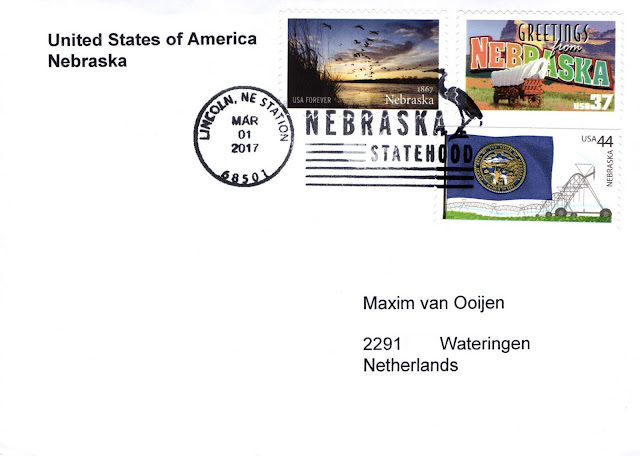 Since I still had to print the country and city names on the envelope, the datestamp could not be too high up. Just five days later the envelope arrived at my home. Macedonia, officially the Republic of Macedonia, is a country in the Balkan peninsula in Southeast Europe. It is one of the successor states of the former Yugoslavia, from which it declared independence in 1991. It became a member of the United Nations in 1993, but, as a result of an ongoing dispute with Greece over the use of the name "Macedonia", was admitted under the provisional description the former Yugoslav Republic of Macedonia (sometimes abbreviated as FYROM and FYR Macedonia), a term that is also used by international organizations such as the European Union, the Council of Europe, and NATO. On 17 June 2018, Macedonia and Greece signed the Prespa agreement which would see the country change its name to "Republic of North Macedonia", pending a national referendum on the matter and legislation passing through parliament. This region's history dates back to antiquity, beginning with the kingdom of Paeonia. In the late 6th century BC, the area was incorporated into the Persian Achaemenid Empire, then annexed by the Kingdom of Macedonia in the 4th century BC. The Romans conquered the region in the 2nd century BC and made it part of the much larger province of Macedonia. Τhe area remained part of the Byzantine (Eastern Roman) Empire, and was often raided and settled by Slavic peoples beginning in the 6th century. Following centuries of contention between the Bulgarian, Byzantine and Serbian empires, it gradually came under Ottoman dominion from the 14th century. Between the late 19th and early 20th century, a distinct Macedonian identity emerged, although following the Balkan Wars of 1912 and 1913, the modern territory of Macedonia came under Serbian rule. In the aftermath of the First World War (1914‑1918), it became incorporated into the Serb-dominated Kingdom of Yugoslavia, which after the Second World War was re-established as a republic (1945) and which became the Socialist Federal Republic of Yugoslavia in 1963. Macedonia remained a constituent socialist republic within Yugoslavia until its peaceful secession in 1991. The first Macedonian stamps were issued on 28 October 1944 on behalf of the German occupation of the territory. After the war, Macedonia used the stamps from Yugoslavia. Since the end of 1992 the republic issues its own stamps with the country name Macedonia. 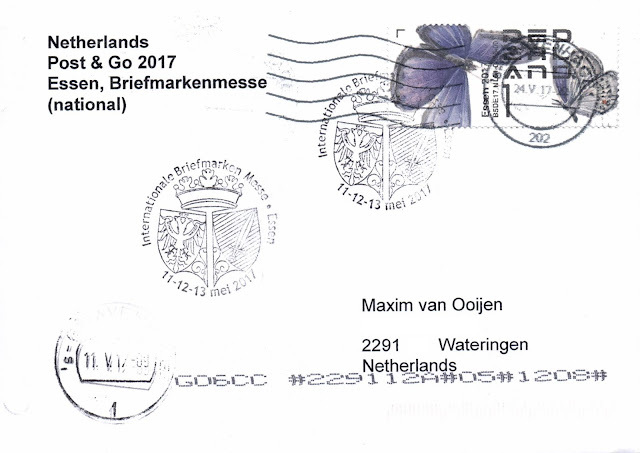 During the Briefmarken-Messe in Essen in May 2017 I left stamped envelopes at almost every foreign postal administration hoping they would send them back when they arrived home. The stamp is one of two stamps issued on 24 March 2004 featuring carpets. According to the catalogue, this design is called Sofra. 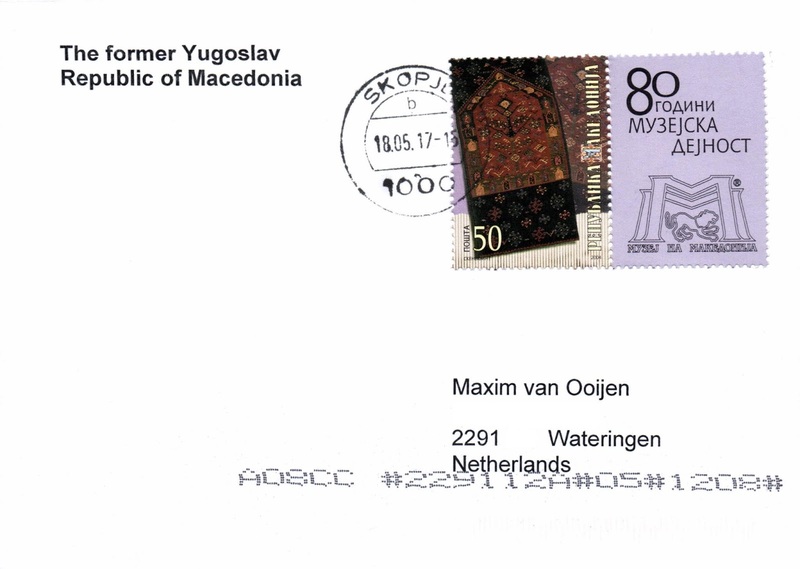 The stamp was postmarked with the datestamp of Skopje, the capital of Macedonia. 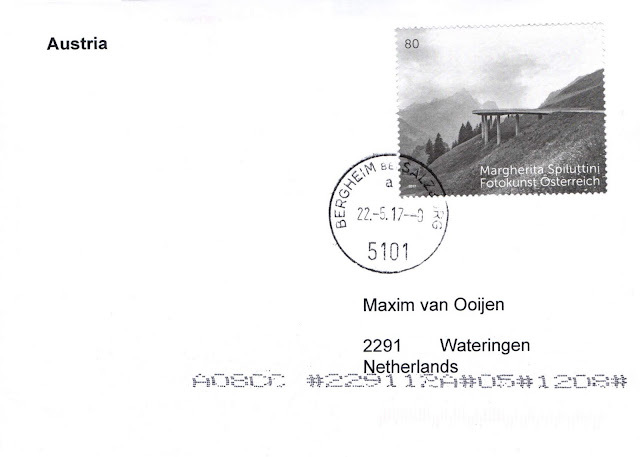 This and other stamps can be found on the website of Macedonia Post: posta.com.mk. Maxim van Ooijen, Wateringen (NL). Awesome Inc. theme. Powered by Blogger.